I had an assignment to photograph 4 woman - all incredibly accomplished - all in their 40's - all involved together running Local Theater Company in Boulder. I was expecting to shoot them in a pretty normal setting looking like we all think they should look. Instead I arrived to everyone wanting to play - fearlessly. It is so much fun when I am completely trusted. I know how to protect my subjects, but the greatest joy is when we can make the box we build around ourselves so much larger. With lots of windows and a big door that opens. I took a photograph of this man at the "21" Club in NY. We lowered the planes so they were closer to his head. He was pretty full of himself then, but always a good sport. All I can think of to add here are a copy of the seven deadly sins: A haught disdainfull look A lying tongue Hands that shed innocent blood A heart that devises wicked plots Feet that are swift to run into mischief A deceitful witness that uttereth lies Him that soweth discord among brethren. Several years ago Ziv Argov was working with Leaf medium format digital backs in Tel Aviv. Leaf called and asked if I would speak to the technicians about how their back was used in the real world. I said, "Sure, but only in person." I was trying to get a free trip to Israel from Leaf. Sure enough, they brought me over for ten amazing days. The scene everyone still talks about was when I was shooting at dawn with their $60K camera leaning out on a rusted pipe structure over the Dead Sea. All the Leaf employees were watching from shore as I teetered over water so salty that any contact with the camera would have made it instantly useless. Last night I reunited with Ziv and so many other friends at Phase One's ‪#‎standoutphotoforums‬ in LA as a featured speaker. I was asked too many times why I had not pushed the talk out on Facebook. Hmmmm.....is this the place people talk about their talks???!! 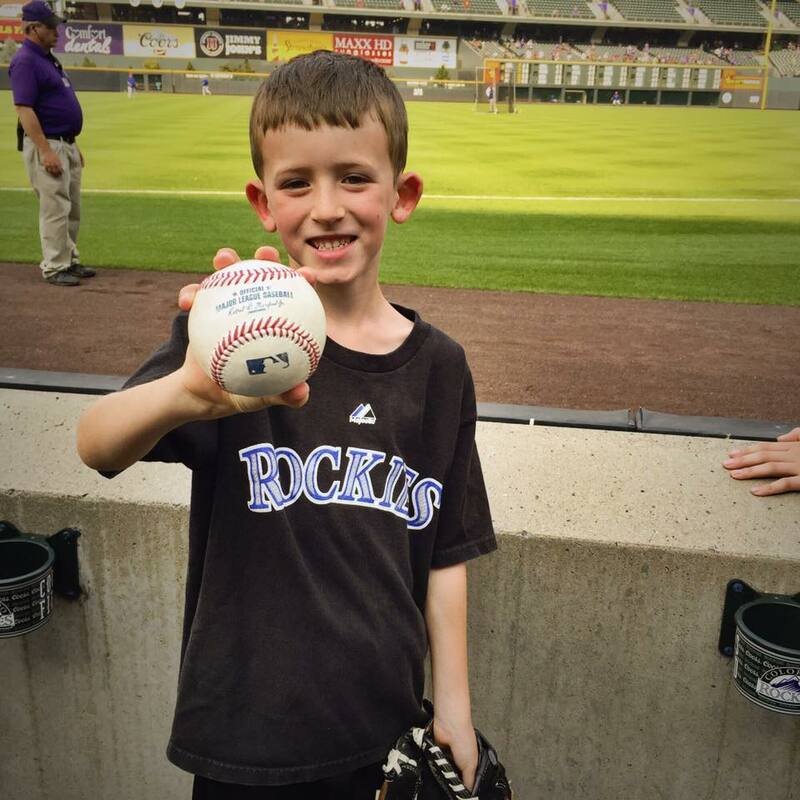 Jackson, my 7 year old and I went to the Rockies game at Coor’s Field in Denver on Saturday night. He always wants to be the first one in the ballpark and the last to leave. We got there before the homeless guys at the parking lot we like to support were ready to take our 20 bucs. We walk over to Coor's holding hands, only stopping for the peanuts with the Rockies logo and some water. 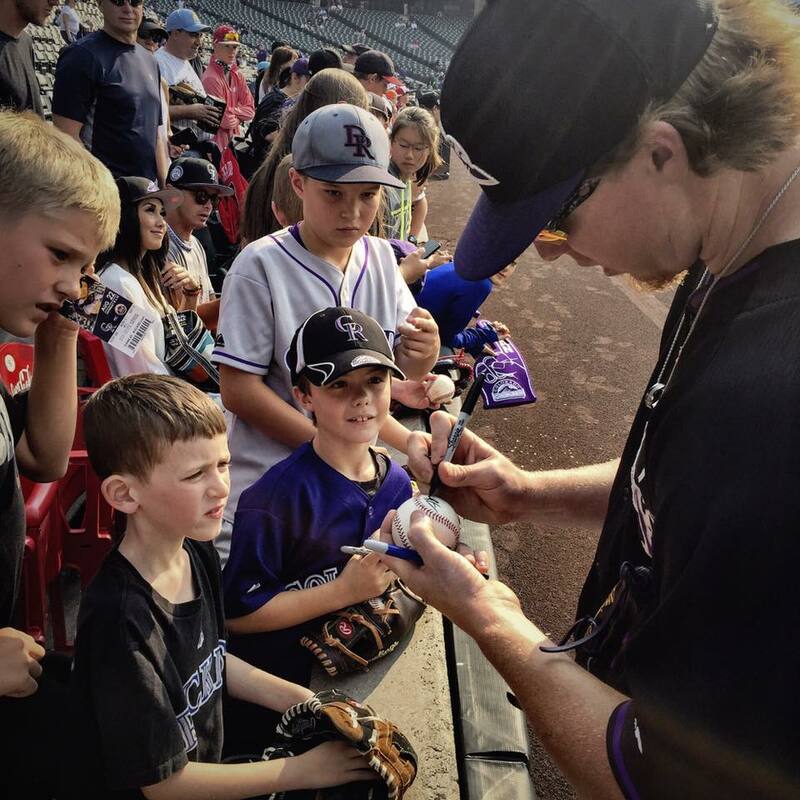 Jackson’s first order of business is to be one of the first 10,000 fans to get a Carlos Gonzalez bobble head. I want to take in that first wondrous view of the ballpark but there is no time for reflection. Jackson quickly sizes up the action for batting practice and gets to work deep down the third base line. He has to position himself so the players can see him. He has learned that players like to hear the word, “PLEASE” when you are yelling out. Jackson doesn’t smile when he waves his glove. His mission to get a ball is serious business. We watch the players warming up in the outfield for awhile. 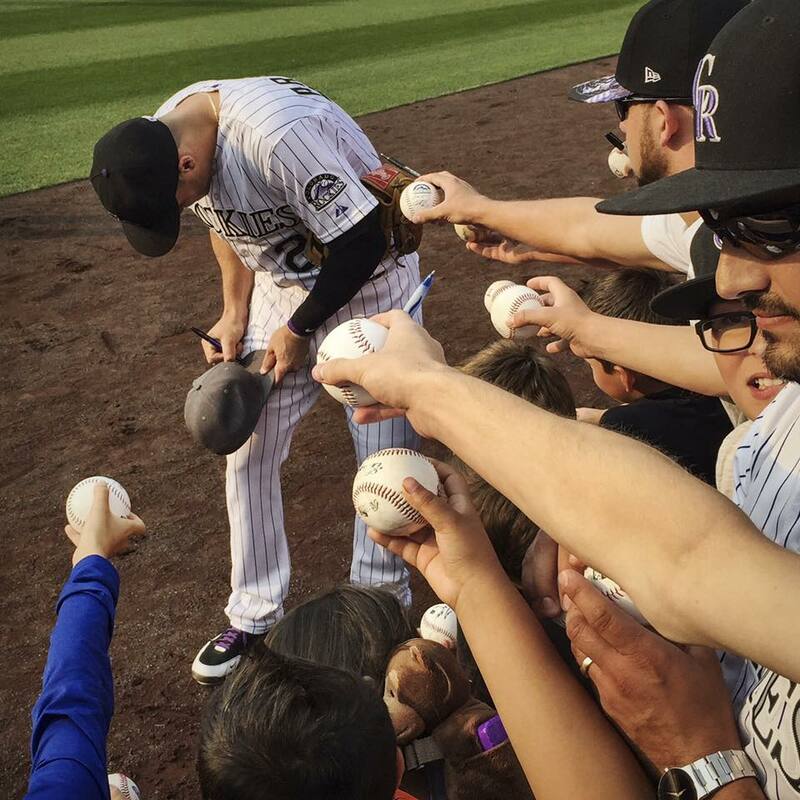 A sea of kids all craving balls and autographs leaning over the low cement wall waving their Sharpies and gloves. Then out of nowhere, one player misses his catch, reaches for it on the ground, sees Jackson and throws the ball right into his outreached glove. Jackson scoops it up in wonder, looks at it, and runs his fingers along the seams. On the scoreboard it says the game will begin in a little less than two hours. It sounds like a lot of time but trust me, it is the journey not the destination. We are together which is the best part. Jackson makes the stadium his own. He goes all over to see different views, check out the new pitcher just up from the minors signing balls over in right field, look at the souvenirs, finally settling for a snow cone. A warm evening baseball game in summer is pastoral and timeless. The sun sets over the left field stands creating long hard shadows that soften then fade away. The Coor’s Field lights glow and illuminate the sea of grass as the sky grows dark and the stands fill up with fans craving lots of cold beer. Finally, (and for all the “journey” talk I don’t say this lightly) 2 1/2 hours after arriving at the ballpark….the game begins. Jackson has “game ball” on his mind. The Rockies end the top of the first inning with a double play. The second baseman DJ LeMahieu is walking off holding the ball. He sees Jackson with his glove up and throws the ball right at him. Jackson catches the ball. I am not nearly fast enough to get a picture. I look at Jackson’s eyes and cannot totally read the shock of relief. It is not a look of entitlement. He is almost tears. I am almost in tears. I can’t describe that moment. We both just stare at the ball in his glove for a long time like it is a gift from a stranger he willed to notice him. I text a picture to Stephie and our moms. I try to not make that big a deal about the ball…it is the GAME after all and being together and all that. I go to the door of Jackson’s room to watch him sleeping as the dawn light sneaks around the edges of his blind. Waiting for the alarm to go off on the first day of second grade. Watching as Jackson gets startled awake to turn off the alarm. It is 6:30AM. I lay next to him for a moment as he calibrates. Jackson has laid out a button down shirt - the first time he has done that since I can remember. His brother Asher comes in the dark room and tells us all to move over and make room. “When I first came to this land, I was not a wealthy man. My friends at Instagram created a great contest in honor of Cannes Lions and the history of photography's great iconic photographs. I gave it a shot. So much FUN! Annie Leibovitz gave me a print of John and Yoko years ago when I was assisting her. I set the framed print up on the floor and tried my version with Stephie and Asher. Any excuse to see in new ways is always a good idea.You should try it and enter. There's a Leica dangling in the balance for the winner that will instantly make you the envy of every photographer.